“Jessica Jones” is a solidly good show, hell I’d even call it one of my favorites…but it is no way in the Top 5 and it has quite a few issues that become glaringly obvious when the final roles around. Now these issues didn’t make me disown or hate the show, but it felt worse than some of the Marvel Cinematic Films that have suffered from similar problems because there was so much more set up in the beginning and so much more potential in the premise, and it had a great cast to boot to make that possible, sadly it didn’t succeed. The show was created by Melissa Rosenberg and created from the Marvel Comics and hosted on Netflix who produced the show. This review does contain SPOILERS, so be warned. 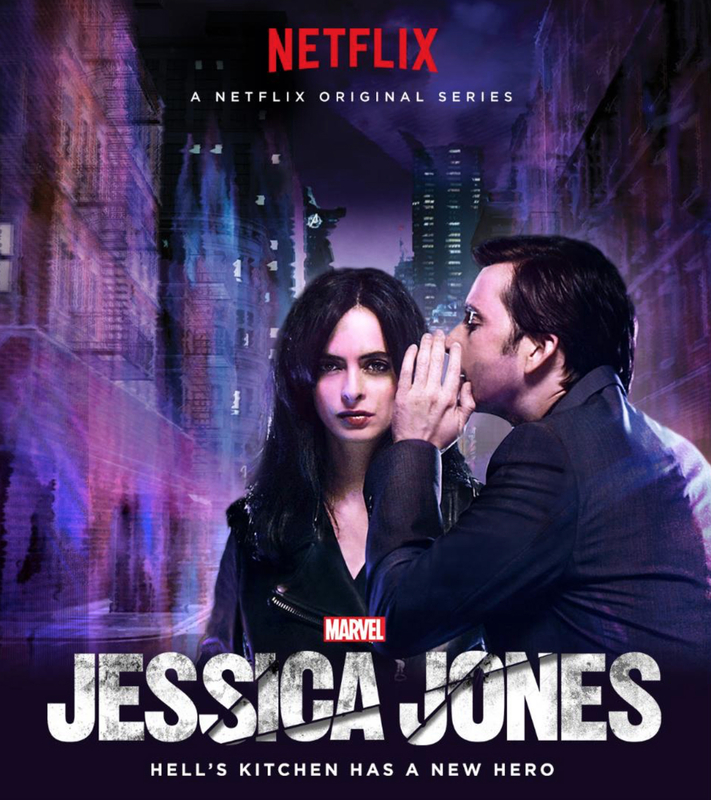 The story is about Jessica Jones (Krysten Ritter) who is a private eye who is trying to find Kilgrave (David Tennant) the inhuman who mind controlled her to murder and do other horrendous things and made her client kill her parents. The Pros: The Soundtrack – The opening is very noir with a light piano piece leading into rising tension before end. Sean Callery did it and did a fantastic job at that. This music is present through the series and sets the tone for the world. The Cinematography – The cinematography is stunning and great use of color contrasts are used, especially the use of purple as Kilgrave is called “The Purple Man” in the comics and anytime you see purple tension rises. Manuel Billeter did a great job. The Characters – The characters, like with “Marvel’s Daredevil,” are easily the strongest part of the series. Part of this is due to writing but a lot of it is just the performance by the actors, as they really get a chance to shine. Claire – Rosario Dawson is back and even though she’s nothing more than a glorified cameo tying the world together for “The Defenders” she stands as her own unique character who has to make difficult choices to help characters and people bigger than the world she knows. In this instance it’s her trying to save Luke Cage. Malcolm – Malcolm is the best minor character in the show and I cared about what happened to him. He’s in the Karen role as he shows himself to be a true friend to Jessica on multiple occasions and in the end is helping her with her agency. Eka Darville does a great job in the role. Hogarth – Carrie-Anne Moss is fantastic as the shark lawyer who is in a divorce with her wife to be with her secretary. At one point she makes a deal with Kilgrave for helps and it ruins her life. It takes Jessica refocusing her for her to begin putting her life back together and doing her job. She’s a great ruthless character, she’s also a lesbian and the show is great at letting her be sexual without it being exploitative, it respects her for the relationships she has, which cinema needs to do more of. Luke Cage – Luke Cage is a good character and I am looking forward to his show. He’s the man with unbreakable skin who has an odd relationship with Jessica as Jessica killed his wife under Kilgrave’s influence and his wife may have played a part in his creation into an inhuman. As the lab she worked with was the lab that turned Jessica and gave her super strength. Will Traval is awesome in the role and it is sad when Kilgrave uses him as his Dragon in his penultimate fight with Jessica leading to Cage’s near death by Jessica’s hands. Trish – Rachael Taylor is great in the “Foggy” role as she is the supportive friend who is there through the thick and thin. Like Jessica she is a survivor of abuse, though from Trish it is from her mother who abused her emotionally and physically and made her a brand starlet to be sold. She sets boundaries with her and those never change. She is willing to do anything for Jessica including being used by Kilgrave to lure Kilgrave into a false sense of security. She really is a good minor character and I look forward to her story unfolding down the line. Kilgrave – David Tennant make a great villain, sadly he doesn’t get great writing at the end. He’s a character obsessed with having Jessica as she is the only one to break free of his control and she’s an inhuman like him. It’s an obsession and he’s creepy in his stalking of her and his taking control of Luke Cage when he learns of her relationship to him. He has so much going to be being one of Marvel’s best villains…and it fails in the end. He only takes control of a small group, he does nothing with Hell’s Kitchen and he gets his neck snapped…in the end he’s underwhelming like every other marvel villain in the MCU. Acted great, but writing brought down only to good. Jessica Jones – Krysten Ritter is a good actress and she was perfect for this role. She’s bitter, lonely and paranoid and dealing with healing from abuse. This is her arc and it is handled decently…sadly it isn’t through Kilgrave’s murder or through her relationship with Luke Cage or even Trish. Malcolm is how we know she’s gotten to the point that she can do more than lash out and use people and it’s a great scene as he answers her phone. This was the one great moment in the finale. Overall, I like her character but thought her writing was uneven, though it isn’t from Ritter’s lack of talent. Ritter like Tennant does a great job with what she’s given, it’s just the script and pacing fail to give her great. Healing From Abuse – Not all our characters get that, but Jessica and Trish are both given the chance to heal and face their abusers and find victory and strength. It’s empowering and I’m glad the show did this. The Kilgrave Survivors Support Group was another great use of this too. The Cons: Simpson – Captain America Knockoff (seriously he looks like Chris Evans and is a super soldier) who serves little purpose as I never believed his relationship with Trish fully and he was way to unstable to like…and his arc never went anywhere. He’s just there to set up Season 2 of “Jessica Jones” or “The Defenders” as he’s kidnapped by the agency and we never hear from him again. Kilgrave’s Power – Kilgrave is given a power boost at the end and he does nothing with it. He doesn’t hold the city hostage, he doesn’t make everyone try to kill one another or try to kill Jessica…he just takes a small group…when he’d taken hold of a hospital before. Seriously he had this huge power buildup and we don’t see him do anything interesting with it. What was the point of getting a power boost if it doesn’t go anywhere? This turned him into every other MCU Villain who falls flat in the Finale. Uneven Pacing – The pacing was uneven at the beginning and the end, it was almost like they got sidetracked with side plots while losing focus on the main story of Jessica Jones and Kilgrave…and it hurt the show. Anti-climatic – Kilgrave takes a small group hostage, does nothing to put safegaurds against Jessica, even though she’s been immune to his ability every single time post him making her kill…and she just snaps his neck. What a waste of a finale. He didn’t feel like a threat at the end and they didn’t make him do anything worthy of having such awesome powers. He should have been a child making everyone kill themselves and one another to force Jessica to make a deal and have to sacrifice…since in the end all he wanted was her, at the end I had trouble believing that. Once again, this is a show that doesn’t compare to “Marvel’s Daredevil,” but it is a good show within it’s own right, mostly from the strength of the actors and actresses and the fact that many of the characters are fascinating enough to hold a scene, even if they have so much unrealized potential. If you like the Marvel Cinematic Universe, this is worth checking out even though I will warn you now, it is pretty anti-climatic and I hate that Kilgrave didn’t use his power to it’s full potential.